Cars parked in the bike lane are a common nuisance for urban cyclists the world over. Sadly, it’s a problem that few cities want to tackle. Until now. Arturas Zuokas, the mayor of Vilnius, Lithuania, wanted to send a message to the city’s driver: Park in the bike lane at your peril. 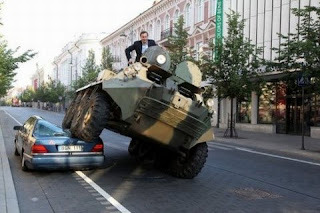 In a rather dramatic public service announcement Zuokas, a 43-year-old former war corespondent, hops on an armoured personnel carrier and crushes a Mercedes parked in one of that city’s bike lanes. Of course, the whole thing was staged, and we don’t actually encourage mayors (or angry cyclists) to destroy cars parked illegally in bike lanes. “I want to point out that if you have a car and more money it doesn’t mean that you can park it everywhere. Recently there’s been an increase in this type of parking violations, and it shows a lack of respect for others,” the mayor told the Irish Times and other media.